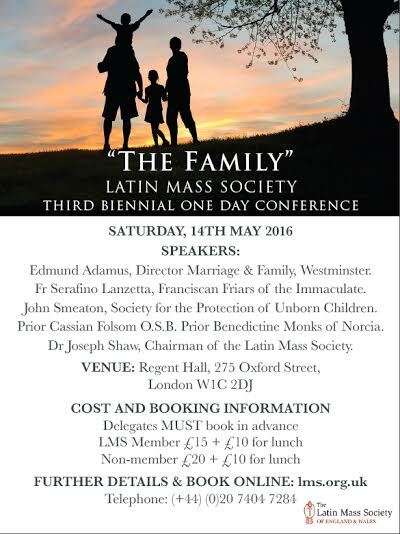 Do consider going to the Latin Mass Society's excellent looking One-Day Conference on the Family, to be held at Regent Hall in London on Saturday 14h May. You can fill in a register form for the conference here. The speakers will, I am sure, be very inspirational and interesting to hear, especially in the wake of Amoris Laetitia, the new document from Pope Francis that is so controversial that a different Catholic lay organisation wish to organise a conference to condemn it. UPDATE: The LMS One Day Conference has unfortunately been cancelled. Mr Bones. A 'Latin Mass Society'? What would Pope Pius XII, think? Let alone St John Fisher? Or, indeed, St Francis de Sales? Or indeed Bishop Pivarunas ( http://www.cmri.org/bishop-mark-a-pivarunas-cmri.shtml )? A second reason for marriage is the desire of family, not so much, however, with a view to leave after us heirs to inherit our property and fortune, as to bring up children in the true faith and in the service of God. That such was the principal object of the holy Patriarchs when they married is clear from Scripture. Hence the Angel, when informing Tobias of the means of repelling the violent assaults of the evil demon, says: I will show thee who they are over whom the devil can prevail; for they who in such manner receive matrimony as to shut out God from themselves and from their mind, and to give themselves to their lust, as the horse and mule which have not understanding, over them the devil hath power. He then adds: Thou shalt take the virgin with the fear of the Lord, moved rather for love of children than for lust, that in the seed of Abraham thou mayest obtain a blessing in children. It was also for this reason that God instituted marriage from the beginning; and therefore married persons who, to prevent conception or procure abortion, have recourse to medicine, are guilty of a most heinous crime — nothing less than wicked conspiracy to commit murder. the children of the Saints, should propose to themselves. If to these we add other causes which induce to contract marriage, and, in choosing a wife, to prefer one person to another, such as the desire of leaving an heir, wealth, beauty, illustrious descent, congeniality of disposition — such motives, because not inconsistent with the holiness of marriage, are not to be condemned. We do not find that the Sacred Scriptures condemn the Patriarch Jacob for having chosen Rachel for her beauty, in preference to Lia. So much should be explained regarding Matrimony as a natural contract. AMEN... AMEN ... AMEN... !!! !